A favourite for the winter garden. It is an unusual bloom to see in winter, with the flowers coming almost as a surprise. On rather short stems, large flowers are produced. They are lavender blue, with delicate markings, and sweetly scented. Iris unguicularis is cultivated in a south-facing position in the Turkish Outcrop border in the Alpine Yard. The plant is famously known in Britain for flowering on Christmas Day. This year, because of the mild temperatures, the plants flowered a couple of weeks earlier. 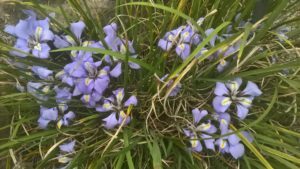 However, it has been said, the erratic flower production that Iris unguicularis sometimes exhibits is also a clever ploy to avoid weather damage (although the buds are frost-proof, the flowers are not). Related to Iris unguicularis and very similar, is the Turkish species I. lazica that prefers shadier conditions. The famous gardener EA Bowles described the species and how to grow it. He observed that “patience seems to be the only manure these irises need”. Also he went to explain that “the older a clump grows the better it flowers”.